First, Pluto got a demotion. Then, surfing the FM dial, I heard a Styx song on the oldies station. And just yesterday, park-side, a nanny chided me: “Star fish? No, kids call those sea stars nowadays.” Oh, really? Lumbering homeward with my sons, doubt swirled about my tiny Stegosaurus brain. I quite liked my Jurassic bubble of backwardness, but was I raising my brood in it, too? As we strolled down the sidewalk, we happened upon a stray green crayon. My kids still doodled with the familiar hues of my youth, but did other children? Or had they ditched that stupid stuff for a new-and-improved, perceptually-optimized, ISO-12647-2-compliant wax-based coloring system? Us Stegosauri can’t type, unless we have something pointy attached to our feet. That evening, thankfully, my boys duct-taped a couple of pencils to my toes. Thus equipped, I hunted-and-pecked across the Internet Dot Com and eventually landed on the web site of Crayola, the undisputed King Of Crayons. Crayola’s crayon chronology tracks their standard box, from its humble eight color beginnings in 1903 to the present day’s 120-count lineup. According to Crayola, of the precious crayons of my childhood – the seventy-two colors from the official 1975 set – sixty-one survive. Today, each is loved to nubs by kids worldwide, just like when I was a sprout. Woohoo! Maybe I’m slightly less ancient than a dinosaur – a woolly mammoth, perhaps? The next day, I gave my buddy Velociraptor a ding-a-ling, and true to form, he yakked his hyperactive yakkage – until I mentioned the crayons. Five quick claw taps rang out from the phone, then silence, a hiss of “check your email,” and click! The line went dead. Good ol’ Velo’s sharp as a tack, but he’s also that way, if you know what I mean. 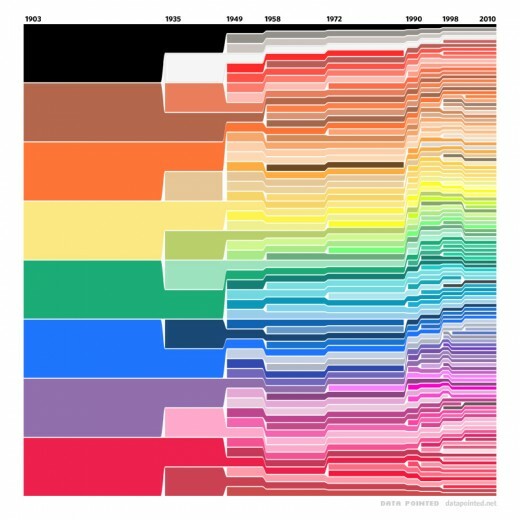 To create the chart, Velo gently scraped Wikipedia’s list of Crayola colors, corrected a few hues, and added the standard 16-count School Crayon box available in 1935. If the Law holds true, Crayola’s gonna need a bigger box, because by the year 2050, there’ll be 330 different crayons! Shortly thereafter, frazzled packaging designers rejoice, for to the rescue comes a revolution in household appliances: the new-fangled Replicator-Dissociator! Load it with the Crayola plugin, and you’re seconds away from every shade in the rainbow – no boxes required! Hal, could you use this leftover broccoli to make five crayons, spaced evenly between Pantone 205 and hex f8b3a2, inclusive, please? Most certainly, John, I can do that. Would you like a dinosaur coloring book, too? Update: Velo has created a new version of his chart!